If you want something that will track, it needs to be something more than a Yellow Torpedo. I haven't looked at them for a long time, but Aire used to make some quality boats. 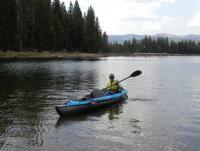 Have you looked at some of the folding kayaks? We've had our inflatable 12-ft Innova Sunny 2-person model for about 13 years now, and have had a whole lotta great experiences in it. Storage is in its own large weather-worthy rucksack with shoulder straps, total weight about 34 lbs, so it's hikeable for a reasonable distance. It has a rear skeg that keeps our headings mostly on track. Flip the seats and skeg around and you have a 1-person setup. For our FWC travel situation it's been a great compromise with respect to value, utility, and space considerations, even if it lacks some degree of functionality vs. a hard-shell kayak. 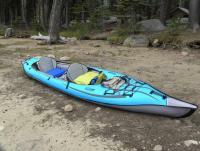 I got an Aquaglide Panther Inflatable Kayak last year and quite like it. And I keep it in the back seat area. As I get braver I get stronger, and as I get stronger I get braver. It’ a good cycle. For several years I would carry our 12' Old Town "stillwater" fiberglass canoe on the camper. Most of the time it would ride along for the many thousands of miles of a trip. Lifting the top wasn't a problem. Plus I felt that if we hurt ourselves loading/unloading the canoe on a trip we would be up a creek (no pun intended). So we got a Advanced Elements inflatable kayak. It's almost like a 2 person hard shell one. About 15' long and tracks well. Only have used a couple times. One other thing about carrying a "boat/canoe/kayak" it's not just the extra weight on the roof to manage,but now in most western states you have to stop and have it inspected at a fee just to drive through that state or buy a season sticker to use in state. I am all for stopping the spread of the nasty invasive s but it can get to be a PITA. This is a nice kayak. Thanks guys these are all good choices and it gives me confidence I can find something seaworthy. Now to push off and paddle through the net! I ordered my Advanced Elements convertible DS series # AE1007ds,from Airkayak .com. It's the deluxe one with the needed extras.Price is $999. Hope this helps. I think that REI carries them or used to. have any of you folks spoken with owners of Oru folding kayak? Seems like these would suit the TC people well. at one point i know they had a rental program.